I should start with a warning: these are not fell walking trousers. For two reasons, firstly when you start doing any work you'll find them too warm and second they're not waterproof, just "shower resistant" and they're poly-cotton so, if they do get wet, they're going to take a while to dry out. So having got that out of the way on to the positive. Now we're into the winter and I'm out every day walking Jake. 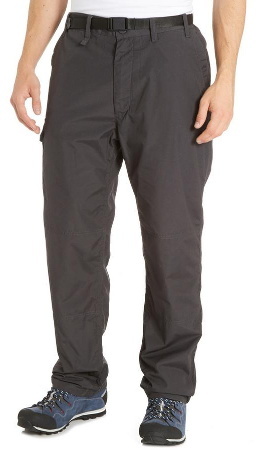 I was talking in the pub about how, being a wimp, I end up with cold legs or wearing either overtrousers or thermals and two people - one man, one woman - both recommended these Craghoppers Kiwi Winter Lined Trousers. The woman said she'd worn them on the beach (which I know from experience can be bitterly cold when there's a wind off the sea) and been pleasantly surprised how warm her legs were: they really did seem to be very effective stopping the wind. So I treated myself to a pair which arrived last Friday. They are available in a "long" leg, which is good for me as I'm 6'4" although I have to say that I don't regard 33" as that long but it's long enough, just. I also find them quite low waisted at the back, but then I habitually wear combats or shorts normally so I may not be typical. Anyway they fitted well enough. A bellows combat pocket on your right thigh with a velco closure and, inside the pocket, a small pocket intended for a (small) mobile phone. This pocket can allegedly take an OS map but I've not checked - seems plausible though. Anyway, first time out and they were lovely; exactly as advertised they kept the wind out and kept me warm. The only catch was a slightly weird one: it felt like the lining was tugging my hairy legs! This seems to have diminished with each subsequent wearing so I think it's some artefact of them being new. The good thing about them is that they're not too outrageous in their insulation that you have to take them off as soon as you get home or when you get to the pub so you can keep them on if you want and they're a perfectly respectable looking pair of dark coloured trousers. About the only thing I'm intending to change it to unpick that velcro closure and replace it with a button as I really don't get on with velcro for pocket closures. Anyway recommended and available (at least) from Blacks, Millets, or Cotswold Outdoor. Note these are the pockets on the men's trousers, the women's seem to have rather less, to the point where Beth said to me that she thought she'd probably buy a pair of men's trousers if she was going to buy herself a pair.